During the summer, when my sister and her 4 kids came for a visit, I showed you the bounty of “junk” my nephew had found near his house and brought for me (here). 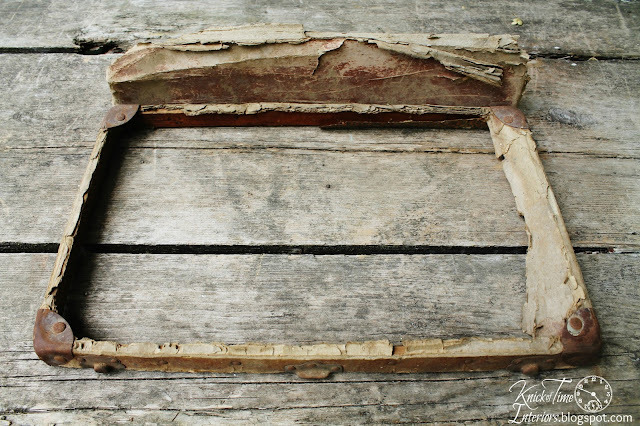 One of the things he brought, was the tattered remains from a small antique suitcase. 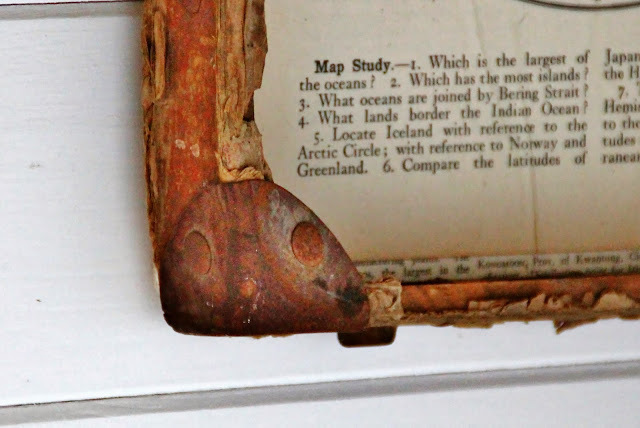 The only thing left was the wooden edges and metal corner brackets, and just a bit of the original cardboard. I loved it – especially the brackets and wanted to come up with something fun to do with it, but I wasn’t sure what. I came across these two map pages from an 1800’s atlas, and thought they’d be the perfect thing to use, so my husband cut a wood piece and attached it to the back and I decoupaged the pages to the wood. It still had the original hinges that connect the top and bottom of the suitcase, so those came in handy to attach wire to hang it by. I wish I had a study or office, because I think it would look great in a room like that. Such a great idea to give two older items a new purpose. I like maps so this totally appeals to me. LOVE IT!!! great find, and great way to use it. I love this. So lucky to have it! Great look Angie … yes, perfect for an office. I had a small rusty metal suitcase … sure hope I did not recycle it. You always come up with the most clever ideas. You sure can create something from nothing. What a fun piece. The maps – a perfect touch! Love this. It turned out perfect. Great vision to see this pieces and see its potential! Love it! The map and the frame go together perfectly. Fantastic project.